Most of us who prefer natural ingredients love the work that bees do. Though honey may be their most popular product, known for its health and skin care benefits, bees product another substance that works great for our skin—beeswax. Known mostly for its conditioning properties, beeswax also has a number of other benefits for the skin, including an action that helps to soften, calm and soothe. Ancient Egyptians used beeswax to make paint for their artists, and during Roman times, it was also used as a skin softener. Today scientists are studying beeswax for its potential to lower cholesterol, relieve pain, and treat digestive ailments. A 2007 study also found that a purified constituent of beeswax may protect liver health because of the antioxidant effects. 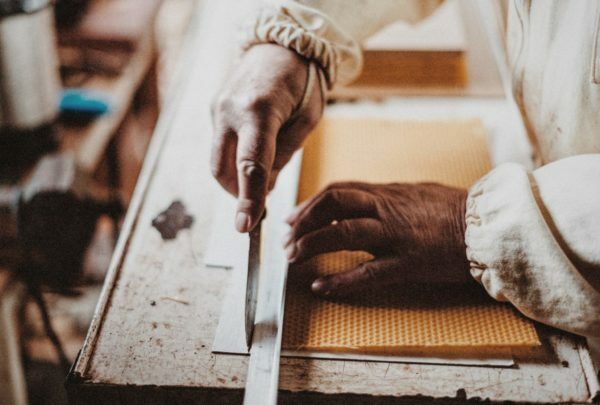 When applied to the skin, beeswax forms a protective barrier that helps protect it from environmental assaults, while also holding in moisture and reducing dryness. This is one of the reasons beeswax is often used in lip balms. Unlike ingredients made from petroleum, however, beeswax doesn’t “suffocate” the skin, and won’t clog pores. Some ingredients “attract” water, and beeswax is one of them. When you put it on, you attract water molecules, helping to keep skin hydrated over time. A good source of this vitamin, beeswax helps exfoliation and can rejuvenate your look. We always say there’s no reason to use harsh chemicals to make products smell good. Natural ingredients work so much better! Beeswax has a natural honey fragrance, and is a favorite in soaps and perfumes because of its pleasant, light aroma. If you suffer from dry skin itching or sensitive skin, beeswax is for you. Because beeswax is anti-allergenic, it is also easily tolerated by even those with reactive skin. We’ve combined both beeswax and honey into our Coconut Honey Mask, where they naturally work together to hydrate, soothe, and soften skin, while delivering key nutrients that help keep your skin looking its best even after you rinse the mask off. Try it and let us know what you think. Do you use beeswax for other benefits? Please share your tips. Mendoza S, Noa M, Pérez Y, et al. Preventive effect of D-002, a mixture of long-chain alcohols from beeswax, on the liver damage induced with CCl4 in rats. J Med Food. 2007 Jun;10(2):379-83, http://www.naturalstandard.com/news/news200706047.asp#. Lewis PA, et al., “A randomized controlled pilot study comparing aqueous cream with a beeswax and herbal oil cream in the provision of relief from postburn pruritus,” J Burn Care Res., 2012 Jul-Aug;33(4):e195-200, http://www.ncbi.nlm.nih.gov/pubmed/22665131. Al-Waili NS, “Mixture of honey, beeswax and olive oil inhibits growth of Staphylococcus aureus and Candida albicans,” Arch Med Res. 2005 Jan-Feb;36(1):10-3, http://www.ncbi.nlm.nih.gov/pubmed/15777988. I used beeswax for the first time today to create dreadlocks in someone’s hair. They looked great and my hands are super soft. I’m going to buy more just for my skin. I love it! I wish we could help but this is pretty complicated and it sounds like you’re doing the best you can with the oil. I would suggest speaking with naturopathic doctor to see if they can give you some advice about how to keep the wound clean and keep it so that it doesn’t re-open. I used to use Burts Bees products, but they were not moisturizing enough – and the overall quality not where I wanted it to be. I ONLY use natural products. I now have been using Made from Earth’s Valencia Orange Lotion, and I like it. It has alot of Beeswax in it. Will try it for another week and let you know how it goes. So far so good and it smells great! Beeswax is naturally a solid. It is used in products in small amounts to add texture and firmness but on its own, beeswax is very hard. I would suggest heating it and adding oil to it if you’re wanting it to stay a nice consistency. For a lip balm consistency, I use about 1oz of beeswax for 8oz of oil. Does that answer your question? I have been making a lotion bar for almost a year that keeps impressing me. 1 part unrefined bees wax, 1 part unrefined coco butter, 1 part unrefined liquid oil, and a few drops of tea tree to prolong shelf life. For the oil I have used virgin olive which produced a smoother skin feel after applying it to my face, and castor oil which produced a slightly stickier feel but makes my skin very happy to the point that people comment on the change (i am a 41yo dude so when even a virtual stranger comments, it stands out). This mixture is a little more solid than many might like, so warm your hands/skin with water before spreading it. I like the high amount of solid wax/oil because it is less greasy and more protective. For me it is all about spreading the bees wax. On a side note, I have also started to rinse my head and face (and other stuff too) with white vinegar for 1 min after every shower. Rinse it off well. It began when I started to use natural soap for shampoo, which forms soap scum in my hair. The solution is to rinse with acid and I noticed that my scalp and face became very “juicy and plump and happy and healthier looking”. Recently I badly burned my arm while cooking while distracted. Not a good combination 😉 anyhow, it’s been a rough process of healing and now the itching has become worse than the initial stinging pain from the burn. I’ve been using a common antibiotic/pain relieving ointment but it really wasn’t helping much, if at all… and I’m not really for the antibiotic creams. So out of desperation, I grabbed my homemade “non petroleum jelly” made with bees wax, and equal parts olive oil and coconut oil. (Found recipies online) I honestly didn’t expect much, and then to my surprise the intense itching was completely gone after a few short minutes! Then after a while, the redness even went down as well… something the antibiotic cream didn’t even do. I decided to use a search engine to see if bees wax had healing properties in it, and came across your page. And so I can give testimony that beeswax in combination with the oils I listed above has given me the best results of relief. Pretty much instantaneous. Hi there, my toddler has eczema pretty bad on the backs of his legs. Would any of your products be suitable for him to use? I’m desperate. I have tried many different kinds from the drug store nothing seems to do the trick. I have been told that the bees wax products work miracles. I would recommend trying our Coconut Honey mask for a deep, nourishing treatment (you can simply apply the mask on his affected areas 1x a day, or a few times a week) You may leave it on for several hours so it can penetrate deeply. The honey is a humectant which helps bind moisture to the skin and the coconut oil is incredibly healing. Another product I’d recommend is our Coconut Body Oil or our Radiant Skin Silk, however, these body products have a little more ingredients in them (they contain an herbal infusion) that are quite active, so I would patch test the area first to see if the products help.